March is International Women's History Month. 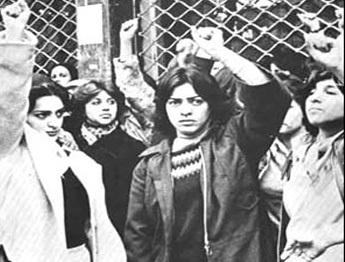 March 2001 also marks the 22nd anniversary of the historic march in Tehran, Iran on International Women's Day, March 8, 1979. On that day, women and male supporters braved Islamic Guards and thugs allied with the new government headed by Ayatollah Khomeini. The march demanded that the revolution, forged by the masses, continue and include freedom for women. As a philosophic contribution to furthering the revolution, Iranian Marxist-Humanists translated and published several writings by Raya Dunayevskaya, listed below. Two of her writings are excerpted here. At its very beginning I had been working on a new book, the topic of which has three subjects. One is Rosa Luxemburg; the second is the relationship of Women's Liberation in her time and ours; and the third is Marx's philosophy of revolution, which had gained a new dimension with the first transcription of Marx's ETHNOLOGICAL NOTEBOOKS(1). I no sooner had reached the first chapter on Rosa Luxemburg, which deals with the turning point in her life--the 1905-07 Russian-Polish Revolution--than all sorts of new facts about its extension into Persia illuminated the Iranian struggles of 1978. At the same time, Marx's ETHNOLOGICAL NOTEBOOKS cast new illumination on the philosophy of Woman's Liberation as it extended Marx's own 1844 analysis of the Man/Woman relationship to his 1881-82 analyses of the possibility of revolutions occurring in backward countries. "In Spring 1908--when the 1906 Constitutional Revolution everyone is talking about today was still alive, and a women's ANJOMAN was still most active, especially in Tehran--New York garment workers declared March 8 to be Women's Day. The following year, in support of the locked-out Triangle Shirtwaist makers, the mass outpouring became known as the "Uprising of the 20,000" that so inspired the German working women's movement that its leader, Clara Zetkin, proposed to the Marxist International that March 8 become an International Women's Day. Today, you--the daring women of Iran--have opened a new chapter in the Iranian Revolution of 1979. In homage to you, and to express our solidarity with your ongoing revolution, we are here translating the thoughts of still another opponent of the status quo, this time in China--Ding Ling, who opposed both Stalin and Mao (who purged the great writer), as she expressed herself creatively in THOUGHTS ON THE EIGHTH OF MARCH." * Luxemburg's speech and a discussion of women in the 1905 Russian Revolution can found in Dunayevskaya's ROSA LUXEMBURG, WOMEN'S LIBERATION, AND MARX'S PHILOSOPHY OF REVOLUTION (Urbana: University of Illinois Press, 1991).